Bornova has been a focus for Western researchers and explorers who follow ancient sources since 17th Century. With its environmental conditions, rich flora and livestock resources, Bornova Lowland had been a settlement for its first residents within prehistoric era. Remnants of the oldest settlement were found in Yeşilova Mound. It turns out that Yeşilova Mound is the oldest known settlement of not only İzmir but of Aegean Region. The 5 mounds, namely Bayraklı, Pınarbaşı, Bornova Anatolian High School, Yeşilova and Yassıtepe mounds, reveals extensive existence of old settlements in Bornova. Yeşilova Mound is the oldest settlement inside İzmir. Before the exploration of this mound in 2003, İzmir was thought to have a history of 5000 years. But after the exploration of Yeşilova Mound and according to findings in excavations, it became clear that İzmir is one of the oldest settlements of Anatolia. Excavations in the mound are still being carried out under the presidency of Assistant Professor Doctor Zafer Derin. Along with Yassıtepe settlement 400 meters north (in front of Forum Bornova) and İpekli Kuyu Mounds (Bornova Anatolian High School) Yeşilova Mound at the centre of İzmir is within the Prehistorical Settlement area of the city. 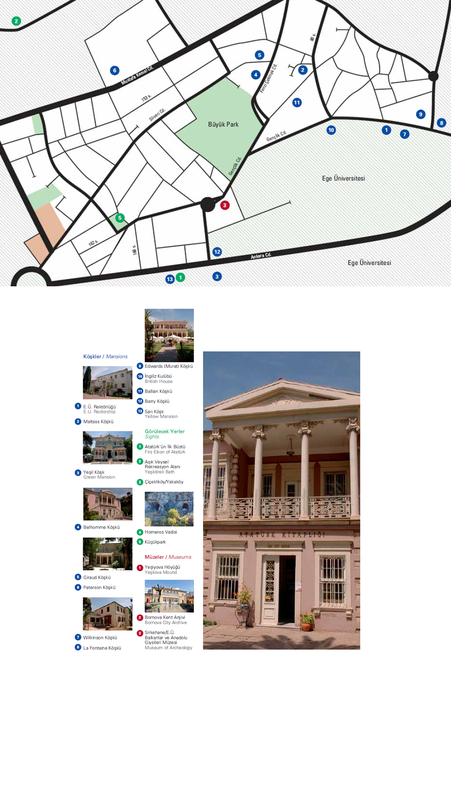 Dramalılar Mansion is brought into town tourism as Bornova City Archive and Museum. With exhibitions on town's sportive, educational, agricultural, commercial and industrial past, vitalisations of past kitchen, hammam and living rooms, the museum takes its visitors to life in the past. Ataturk bust which was sculptured by Austrian sculptor Heinrich Krippel at the backyard of School of Agriculture, which was visited by Atatürk on June 18th., 1926, in memorial of this visit, is one of the first and less known sculptures of Krippel and maybe the first bust of Atatürk. The building extant with the name Sirkehane is thought to have been built by a Greek family during late 19th and early 20th centuries. In 1960's, it is used as a plant for vinegar and pickle production by Ege University Agricultural Faculty Technology of Food and Fermentation Department and front part as a lodging building. The building, most of which was broken down in the last 20 years, is open for visit as Ege University Anatolian Clothes Museum after its restoration completed in 2010. In Aşık Veysel Recreation Area, located in Bornova on an area of 231 decares, are Olympic ice rink and ice hockey hall tribunes, amphitheatre of five thousand seats, walking tracks, basketball and volleyball courts, tennis courts, mini football courts, 2 cafeterias and recreation sites. There is also a car park of 641 vehicles. Among new addresses for those who want to get away from the city at weekends, Çiçekliköy – Yakaköy are placed near the top. Turkish village breakfast adorned with natural food attracts visitors of clean air with restaurants and ever-mounting breakfast venues, in green face of Bornova, Çiçekliköy. These two villages, laid together 2 kilometres to Manisa-İzmir highway and 6 kilometres to Bornova, are seen as lungs of Bornova and İzmir. Lying between the centre of Bornova and Kayadibi, Homer Valley is a perfect recreation area for a daily trip and for those who want to get away from busy city life. Homer Valley is an ideal place for those who want to spend a peaceful day, touch the nature and who want a tough walk. Homer Valley is named after famous author of Iliad and Odyssey. According to a myth, Homer had lived in a cave in the valley. There are ponds and water jumps, picnic areas surrounded with flowers and trees along the valley of around 7 kilometres' long. With endemic plant species specific to İzmir, contributing to the city's ecological structure, Homer Valley of 500 thousand square meters is a natural wealth of İzmir. In Bornova, which is a town with high energy due to the large university student population, the heart of night-life beats in Küçükpark. With cafés and restaurants more than a hundred, Küçükpark is vivid at all hours of the day and night. In the area where bars and clubs preferred by mostly youngsters intensify, there are night clubs for all tastes with different kinds of music. Being a quiet street with a couple of cafés in early 2000's, Küçükpark went through a rapid conversion in 10 years and became a centre of venues, a frequent destination for youngsters not only from Bornova but also from all around İzmir. “Grand House” Ege University Rectorate It is known that there was a monastery in the area where Ege University rectorate building is located today, in early 18th century. The house, built on this land as a single floor building firstly by a Netherlander migrant, was bought in 1820's by James Whittall, one of the shareholders of Whittall Company who settled in İzmir for commercial purposes in 1817. After his death, property of the house was passed to possession of his brother Charlton Whittall. In the following years the house is widened, added new floors and it began to be regarded as “Grand House”. Due to the position of Whittall family in social and political life, Grand House hosted many important figures in different dates. Sultan Abdülaziz (1863), Edinburgh Duke Alfred Ernest Albert and George Frederick Ernest Albert (1886) – to ascend English throne as George V. in 1910- and Greek Prince Andrew (1921) are some of these important guests. Grand House, property of which passed into Giraud Family's possession, relatives with Whittall Family, was nationalized in 1960 and handed over to national treasury. Later on, it is passed into possession of Ege University. The building is still serving as Ege University Rectorate Building. Kocaoğlu House / Maltass Mansion Maltass Mansion which is on the street once known as Uzun Sokak (Long Street), belonged to Audrey Maltass, widow wife of Geoffrey Maltass. It is 120 years old. Couple of years ago, it is bought by Aziz Kocaoğlu, Mayor of İzmir, as an example for restoration of historical houses. Bardisbanian Mansion / Green Mansion The building, known as Yeşil Köşk (Green Mansion) today, after the name “Pandispanya Mansion” being used in the last quarter of 20th century, is estimated to have been built by İzmirian Armenian merchant D. A. Bardisbanian who was involved in import and export business in the last quarter of 19th century. In that period it was located across Bornova Train Station, at the start of farm lands opening to Bornova lowland like some other neighbouring mansions. Bardisbanian Family is said to have migrated to France at the end of 19th century. After deoarture of Gasparian Family that took over the mansion from Bardisbanian Family, from İzmir, the mansion was nationalized and used by Bornova Agricultural School. Following restorations carried out in 1993 and 1995, it is now used as a social facility serving as cafeteria and restaurant for university's academic and administrative personnel and students. Belhomme Mansion Belhomme or Xenopoulou Mansion is built in 1880 by an English architect named Clark who also built Aliberti House. The first owner of the house is recorded as Xenopoulou. Later it is bought by grandfather of the last owner of the house, Helene Armand. Facade of the house is pretty remarkable with columns ornamented with elegant cantilever capitals. Facade and two magnificent columns were restored in 1997. Belhomme Mansion on Fevzi Çakmak Street No: 34, is now serving as Bornova Municipality Library (Atatürk Library). Giraud Mansion Two mansions on Fevzi Çakmak street facing Bornova Square, were built by a Greek called Marcopoli in 1860. These two houses stand almost next to each other with a big and lovely garden lying at the back. It is said that more than 30 years ago it was possible to see the sea from this garden. The house on the right is standing original. The other in which William Giraud and his wife Gwen from Paterson family lived, was rebuilt ninety years ago by Harold Giraud. The Impressive colonnade is added later and the house still keeps its beauty. One of the most valuable things in Giraud House is portrait of Jean Baptiste, founder of Giraud Family and the company in İzmir in 18th century. Another portrait shows Lui Cortazzi, Jean Baptiste's father in law and last consul of Venice Republic in İzmir. W. Giraud's father is the founder of first cotton textile factory in Turkey. Giraud Mansion was bought by Küçükbay Family in 1994 and is used as a residential building since then. Paterson Mansion Paterson Leith, the first owner of the house, was a corn merchant from Scotland. Well known in İzmir, Paterson carried out many profitable ventures especially in mining industry until 1859. Additionally, Paterson is said to be the person who discovered chrome in Turkey. Paterson Masion, built on a land of 133 decares, half of which is used for barns of racehorses, is a mansion of 38 rooms worth seeing. John Paterson was so into change and facade of the house was changed many times. Although no one from the family lives in Paterson Mansion since 1963, great pianos of the house have been kept in the mansion until 1972. Last residents of the house were NATO personnel who lived here for five years. After approval of High Council of Monuments, in 2001, recreation was carried out on an area of 54 thousands square-metres by İzmir Metropolitan Municipality. Seating groups and walking tracks were built. Ornamental pool was restored and renewed with natural stones. A café-bar was built in the backyard of the house. Tenure of the house is handed over to İzmir Metropolitan Municipality by Ministry of Culture for 49 years. After the restoration of the mansion, efforts to bring a tourism facility to Bornova and İzmir are going on. Wilkinson Mansion / Ege University 50. Anniversary Mansion One of the old Levant houses of Bornova, Wilkinson Mansion was built in 1865 by James Whittall, who was then a resident of famous grand House, for her daughter Jane who was married to Richard Wilkinson, consul of Thesselonike, Malaga and Manila. As mentioned in 1821 İzmir travel notes by English traveller John Madox who visited Jane's grandfather Charlton Whittall and Richard's father Richard Wilkinson in their early years in İzmir, friendship of the two families turned into kindredship with this marriage. This mansion which was built after demolition of studs on the land between Grand House and St. Mary Magdalene (opened for worship in 1857), was used by Wilkinson Family for generations, until 1985. The mansion was sold out to Filidis Family in 1988 and nationalized in 1997 for utilization of Ege University. Standing desolately until 2005, the mansion was restored in memory of the 50th. Anniversary of foundation of Ege University, and attained its new identity. The mansion is now named as Ege University 50th Anniversary Mansion Art Gallery serving as an art centre of the university and as Ege University International Relations and EU Office. La Fontaine Mansion / Former Ege University Faculty of Education Deanship Building La Fontaine Mansion is seated across St. Mary Magdalene Church and next to Murat Mansion. The owner of the building seen on records is James La Fontaine (1881-1930). James La Fontaine is son of Blanche Magdalene Whittall, grandson of Charlton Whittall who bought grand House in 1836. He also owned the building which is today utilized as Ege University Research and Application Center on Women Studies and Ege University İzmir Research and Application Centre. This building, known also as Well House, and La Fontaine Mansion were passed into possessions of James La Fontaine's wife Clara Lilian La Fontaine's (Keyzer) and their children Rhoda's, Rodney's and Audrey's following his death. In 1941, the mansion is bought from the family by Clara La Fontaine's nephew, Ruby Gladys Whittall (De Zandonati). The Mansion is bought by Ege University from Ruby Gladys Whittall in 1963 due to facility requirement. From that date on, the mansion is used by many state institutions. It will be utilized as Ege University Research and Application Centre for Atatürk's Principles and History of Turkish Revolution and museum after being restored. Edwards Mansion (Murat Mansion) / Ege University Community Center The land, on which the building known as Murat Mansion was built, was sold to Edwards Family by James Whittall in 1820's. Charles Edwards is an army officer who settled in İzmir following the retreat of British Army from Egypt. He is known to have been dead a while after settling in the city. As to his son Anthony Francis Edwards, he had been an important figure of press life in İstanbul and İzmir from 1830 on. Construction of İzmir-The Town (Turgutlu) Railway and establishment of İzmir Gas Company has been stated among his contributions to city life. Extant name of the mansion is thought to have been taken from Constantin Murat, to whom Anthony Francis Edwards's daughter Emily was married. Murat Mansion was utilized as a social services centre for university students for some time following the restoration carried out in 2003. In early 2005, it was allocated to Ege University within a common protocol. Murat Mansion is now serving as a communication and meeting centre for student communities as well as with its cafeteria. Well House (British Club) / Ege University Research Centre on Women Studies The mansion next to the land of Grand House is also known as “Well House” or “British Club”. The oldest recorded owner of the house is James La Fontaine who is grandson of the owner of Grand House, James Whittall (1819-1863). He also owned the building which is known as La Fontaine Mansion and had been used as Ege University Faculty of Education Deanship until a while ago. This building and Well House, were passed into possessions of James La Fontaine's wife Clara Lilian La Fontaine's (Keyzer) and their children Rhoda's, Rodney's and Audrey's following his death. The square in front of Well House had been an important meeting point for Old Bornova's social life in 19th and early 20th centuries. Neighbours sitting on porches outside the gates of the houses in the square used to chat with each other and with pass-byers. Men attending to the British Club with lecture rooms and card rooms, used to sit on small tables in front of the gate and spend time here. Later used as a social centre for British families, the building was known as Well House due to the cistern next to it. Ballian Mansion / Ege University Strategy Development Department Levant house, the oldest recorded user of which is Ballian Family, was built in the second half of 19th century. The mansion standing out with cornices and centrepieces was bought by Esther Marian Giraud (Wilkinson), wife of Charlton James Giraud, from heirs of businessman Antoine Ballian, namely his wife Attilia Ballian and his children Marian Laura, Alfred, Adelina and Albert. Following Esther Marian Giraud's death in 1955 it is inherited to her children Friedrich, Joyce, Donald, Norman and Eldon. The building was nationalized in 1970 and bought from these five siblings. It was used as boarding high school of nursing and archive through years. Today being used as Ege University Strategy Development Department, the building is planned to serve as a museum after being restored following removal of the department into its new building. Pasquali Mansion (Barry Mansion) Ege University Club The building known as Bari Mansion is thought to have been built in mid 19th century. According to information given by Pasquali Family, the building must have been built between 1835 and1840 by merchant Giuseppe Pasquali, father of whom had migrated from Chios to İzmir. After Giuseppe Pasquali, his son Giovanni Pasquali and his wife Giulia Pasquali (Barry) had lived in the mansion. Giulia, daughter of merchant Polycarpe Barry, translator of Italian Consulate, was an idol. And after death of Giovanni Pasquali, people from Giulia's family moved into the mansion. This is why it is thought the mansion is called Barry Mansion. After death of Giovanni Pasquali in 1925 the building was inherited to his wife and three living children Rene, Christine and Joseph. It was nationalised by national treasury for use of Bornova School of Agriculture in 1941. The mansion which lost one third of its garden due to road enlargement works, is today serving its guests as University Club with its beautiful garden. Sarı Mansion (Yellow mansion) / Ege University Faculty of Economic and Administrative Sciences Deanship Building There is no information about the owner or the oldest residents of the mansion built in early 20th century. Along with Green Mansion and some extinct neighbouring mansions, Yellow Mansion is located across Bornova Train Station. The plants and terrains between Ege University Hospital and Green Mansion were nationalised in 1924-1925 due to need of Bornova School of Agriculture founded in December, 1922. Yellow Mansion, which is on one of these terrains, served as School of Agriculture Directory building until it moved into its new building completed in 1933. The mansion is well preserved and remarkable with gilded fireplaces, oval pool in front and bust of Atatürk in the garden.